National Senior Citizens Day was first celebrated in 1988 as a result of a proclamation signed by President Ronald Reagan. Each August 21st, people from across the United States celebrate, recognize, and support senior citizens for their contributions to the community. National Senior Citizen Day is also aimed at raising awareness for the safety of our senior citizens, both economically and physically. Unfortunately, the senior community is often targeted by scammers searching for sensitive, personal information. This is why it’s important for us to educate and raise awareness among seniors and family caregivers, in the hopes of identifying, avoiding and resolving these senior scams. 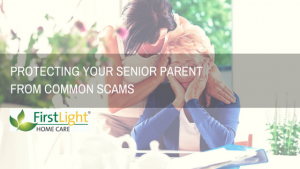 We turned to the experts at LifeLock to provide information on some of the most common senior scams and how to protect your parent or aging loved one. Mail: Theft can occur once a criminal has obtained one’s publicly listed USPS mailing address. Scammers, who often pose as donation collectors, can attempt to exploit an individual for financial, medical, tax, and Social Security information. As discussed here, all of this information can be used to commit acts of identity theft. Phone: Telemarketers, fake debt collectors, donation solicitors, and even criminals who fraudulently represent government officials can target senior citizens in order to obtain personal information or money. Digital: Cybercrime strategies, including password theft, account hacking, data breaches and viruses are commonly used by criminals to disable and obtain information from vulnerable individuals. Once personally identifiable information is fraudulently obtained, a criminal can hold the information for ransom, sell it to the highest bidder or use it themselves to drain accounts, apply for loans or accept government benefits. Understand who you’re dealing with: Be sure your parent understands the importance of verifying emails, phone calls and mail. Before responding to someone who is asking for sensitive information, it is important to identify and authenticate them. If it’s not possible to verify their identity or their employer, it’s best to not respond. Monitor bank accounts: It is always a good habit to check financial accounts on a weekly basis. Most banks have online banking, in which you can monitor transactional history and account balances. With routine check-ups, you can help your parent catch any suspicious activity that may be taking place. Report scammers: If you happen to catch someone who is attempting to pull off a senior scam, report it. If more people report scams, it is more likely that criminals will be caught. Depending on the type of fraud, the strategies to resolve it may vary. No matter what the case may be, do not wait to take action; the sooner you can try to combat the issue, the better. The following includes tips on how to deal with common fraud issues. Government identity theft: This occurs when a person falsely shares your information with the government. For example, scammers could file income tax returns in your name using SSN and other personal information in the hope of getting a tax refund. In the case of government identity theft, contact your local police, the Federal Trade Commission and a major credit reporting agency to put a “fraud alert” on your credit report. Criminal identity theft: It’s possible for victims of criminal identity theft to have a warrant out for their arrest for a crime they did not commit, likely because someone gave false information to police after getting into trouble with the law. If this is the case, call your local law enforcement agency and the agency that has issued the warrant. Your local agency should be able to help prove your identity and resolve the issue. Ask for copies of their medical records from the providers where their identity may have been used fraudulently. Ask your parent’s health care providers for a list of the individuals or companies who have access to their protected health information—it may have the same errors. Reach out to medical facilities that are requesting payment for services your parent didn’t receive. Notify them about a potential case of identity theft or mistaken identity, and request information about the service that was provided to help prove your parent didn’t receive that service. File a police report in your local jurisdiction. Make sure your parent knows that scammers are out there. One of the best ways to protect your loved one against fraud is to talk to them about some of the most popular senior scams. As a family caregiver, it’s also important that you educate yourself on these common scams so that you know what to look for. When caring for your parent or other aging loved one, having regular discussions with them can help ensure they don’t fall victim to fraud. Do you have any tips for helping your aging parent when it comes to potential fraud and common scams? Share your advice by commenting here or head to our FirstLight Facebook page to join the conversation.